I am indeed a glutton for punishment. Even with my already packed schedule, I couldn't resist the opportunity to attend a reception Friday evening at the California Historical Society to promote the soon-to-be-released book Paul Frenzeny's Chinatown Sketches: An Artist's Fascination with San Francisco's Chinese Quarter, 1874-1882, by Dr. Claudine Chalmers. The event was cosponsored by the Book Club of California, which is publishing Dr. Chalmers' book. Dr. Chalmers' 1991 dissertation was on L'aventure française à San Francisco pendant la ruée vers l'or ("The French Adventure in Gold Rush San Francisco, 1849-1854"). While conducting her research she became particularly interested in the work of Paul Frenzeny, an expatriate who had been posted to Mexico as a soldier to fight with the French army. When he was released from the army, he did not return to France but instead went to New York to learn art. In 1873 he and another artist, Jules Tavernier, were hired by Harper's Weekly for a year-long sketching tour of the western frontier. After the tour, between 1874-1882, Frenzeny sketched seventeen illustrations of San Francisco's Chinatown, which were also published by Harper's. 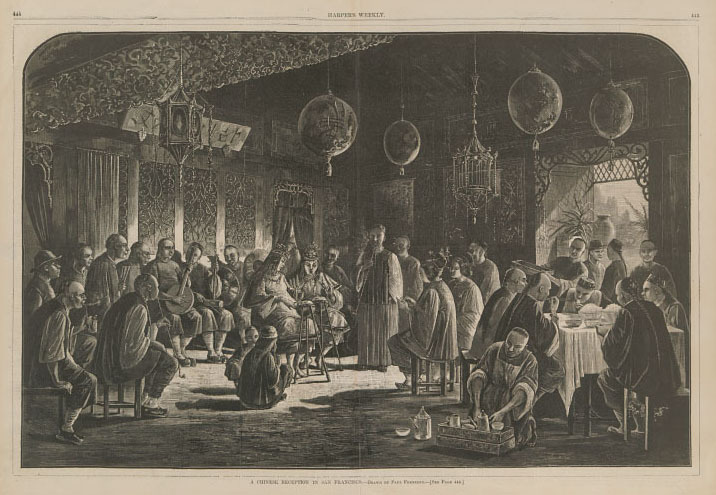 In contrast to most media depictions of the Chinese during that time, Frenzey's illustrations were largely sympathetic and showed several scenes of everyday life and of celebration. Chalmers' new book will discuss in detail Frenzeny's Chinatown sketches. Several pages from the book were on display last night, showing clearly that it is being produced in very high quality. For anyone researching the Chinese in San Francisco in this period, it would be a worthy addition to a library, albeit at a steep price ($125). Though the book does not yet appear on the Book Club of California's Web site, I was told that they are currently accepting preorders. There were also flyers last night for a lecture and slide presentation by Philip P. Choy, who wrote the forward to Chalmers' new book. Mr. Choy will be speaking on "An Insider's Guide to the History of San Francisco's Chinatown" from 11:00 a..m-12:30 p.m. on Saturday, October 27, at the San Francisco Public Library Latino/Hispanic Community Meeting Room, on the lower level of the main library. The address is 100 Larkin Street, San Francisco. The presentation is free and open to the public.